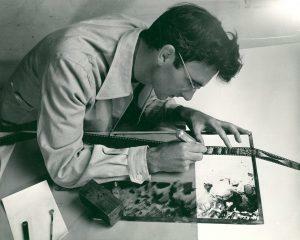 Norman McLaren, the award-winning animated filmmaker, was born at 21 Albert Place, Stirling, opposite the Stirling Smith on 11 April 1914. Using material from the University of Stirling’s extensive Norman McLaren Archive along with items loaned from the McLaren family ‘A Dream of Stirling’ is the exhibition which looks at the influence of his Scottish upbringing. A pupil of Stirling High School McLaren’s artistic talent was recognised at an early age. In the 1930s, while a student at the Glasgow School of Art, his work was exhibited in the Stirling Smith as part of the Stirling Fine Art Society shows. Norman’s father William was an active member of the society and the exhibition catalogues include advertisements for his decorating business in Maxwell Place. ‘A Dream of Stirling’ will include examples of Norman McLaren’s artwork from the 1920s and 1930s. Much of this material has not been publicly displayed for over 70 years and has been specially conserved, mounted and framed for the exhibition which runs at the Smith until 22 June.